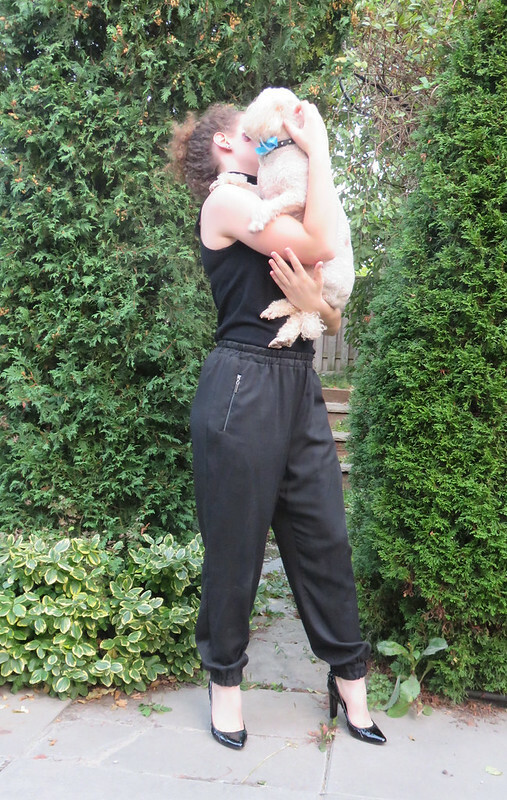 I made these for DD1 earlier this year from a medium-weight 100% tencel fabric, as she needed basic black pieces for a job this past summer. 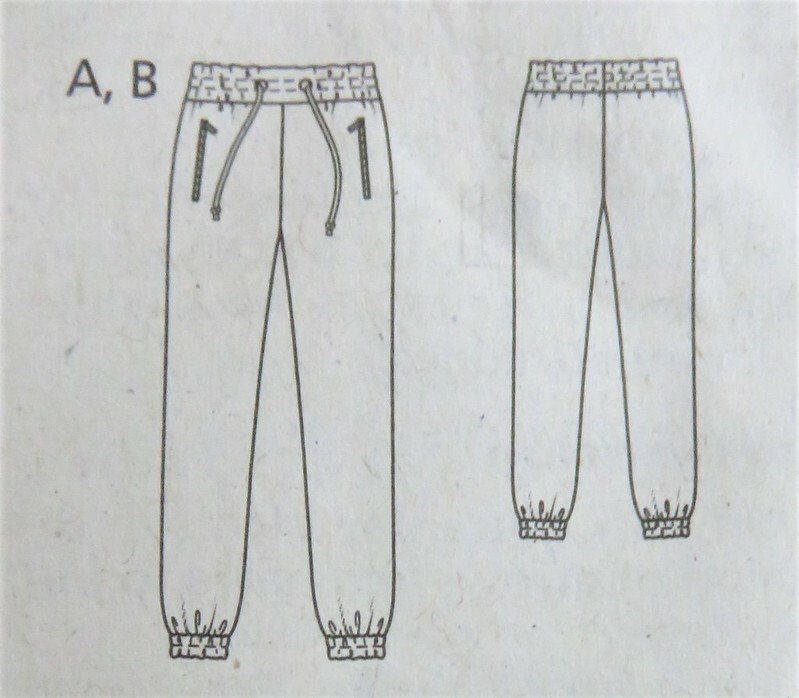 I made no changes to the pattern except to omit the waist ties, at her request, and she agreed to let me share them with you on the condition her face wouldn’t be seen. *sigh* Her only other request was that they would be ‘loose’. I cut the size to match her hip measurements. 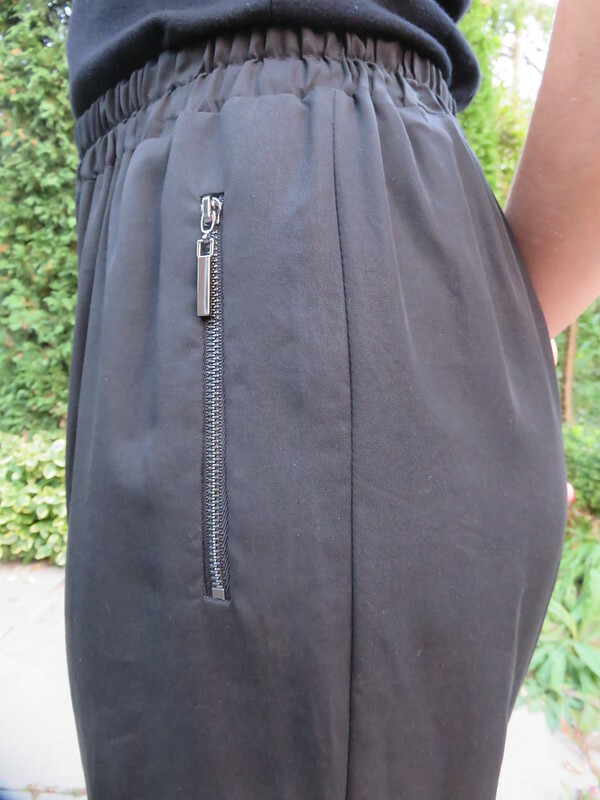 And I managed to find black zips for the pockets, which made me very happy. Fancy zippers are not easy to source here. Here they are zipped…. They turned out to be a little too casual for work, so she’s only worn them a couple of times. 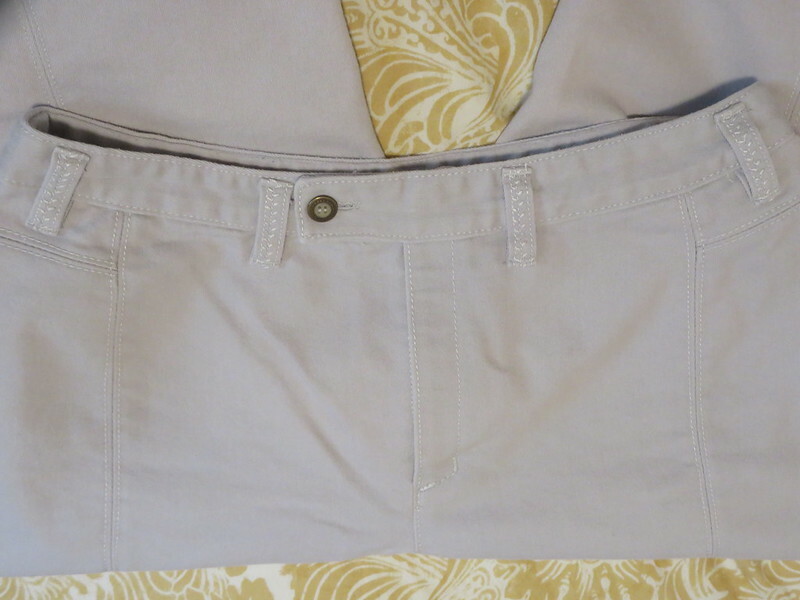 They were fun to make, and I’m pleased with the zipped pockets. 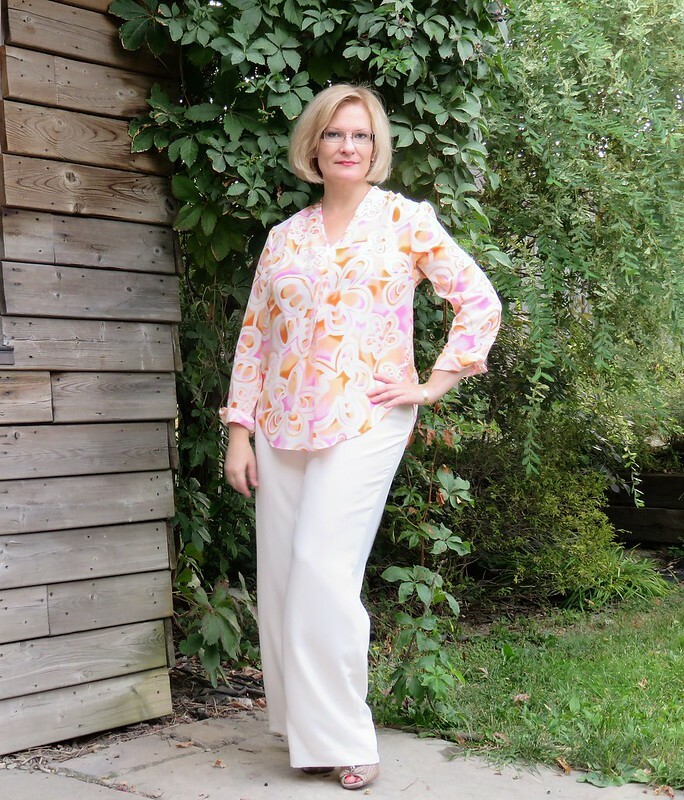 This is my second version of the Rebecca Taylor top from Vogue 1412, this time in crepe de chine. 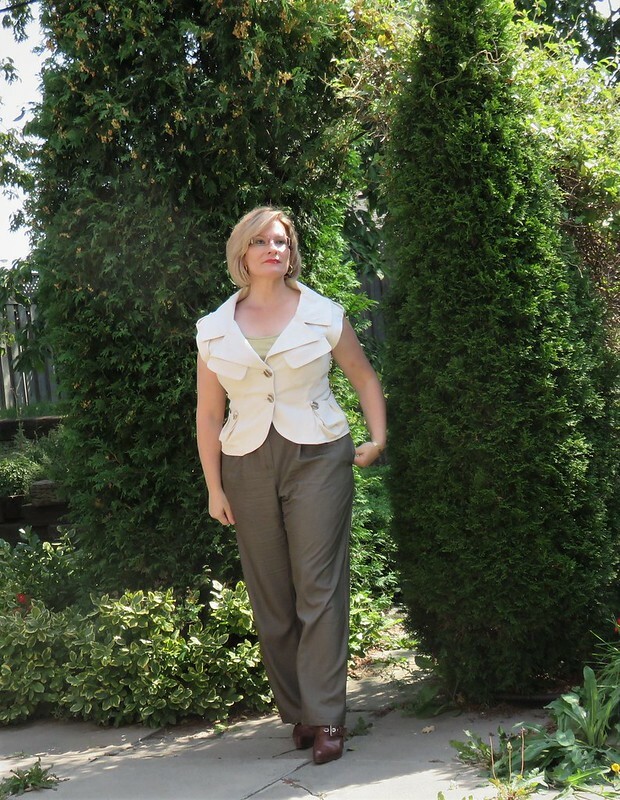 The trousers are Burda 12/2011 #133 in a polyester crepe from very deep stash, and fully lined in bemberg. 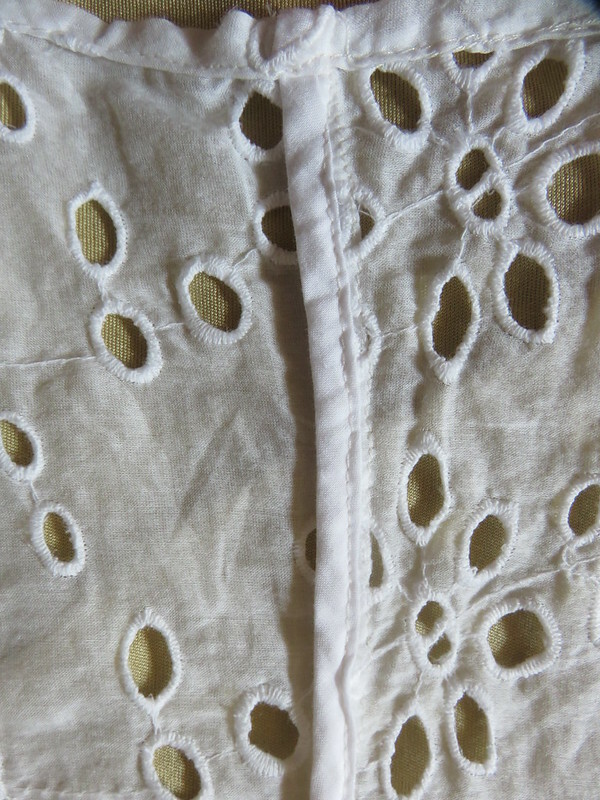 This is the inside of the blouse front once the buttonholes and buttons have been finished. This shows the true colours of the silk. 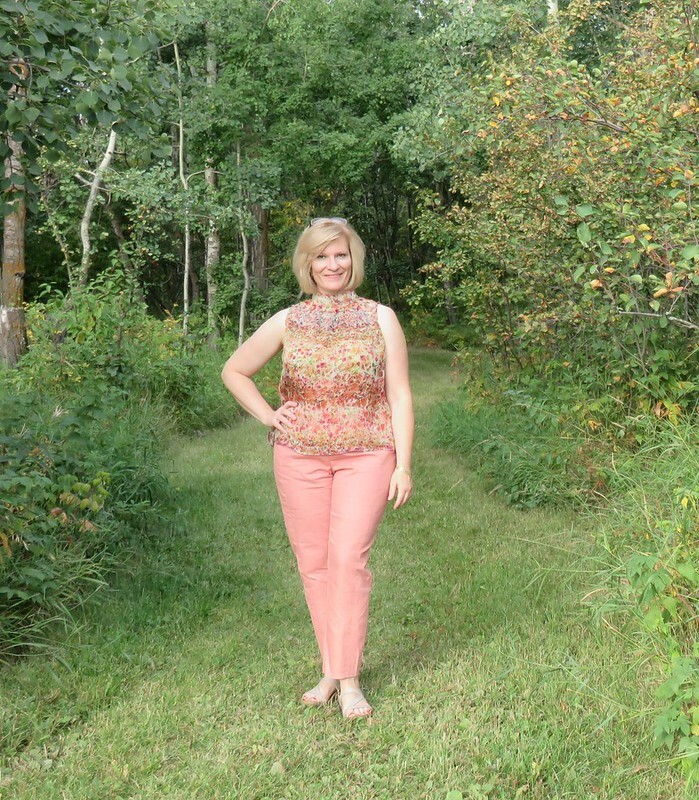 It’s a rather spring-coloured outfit, but I thought I’d share the makes even if it’s autumn. Earlier this summer I went on a stash-busting spree. No particular motive in mind, except that I was so sick and tired of feeling ugly and underdressed. 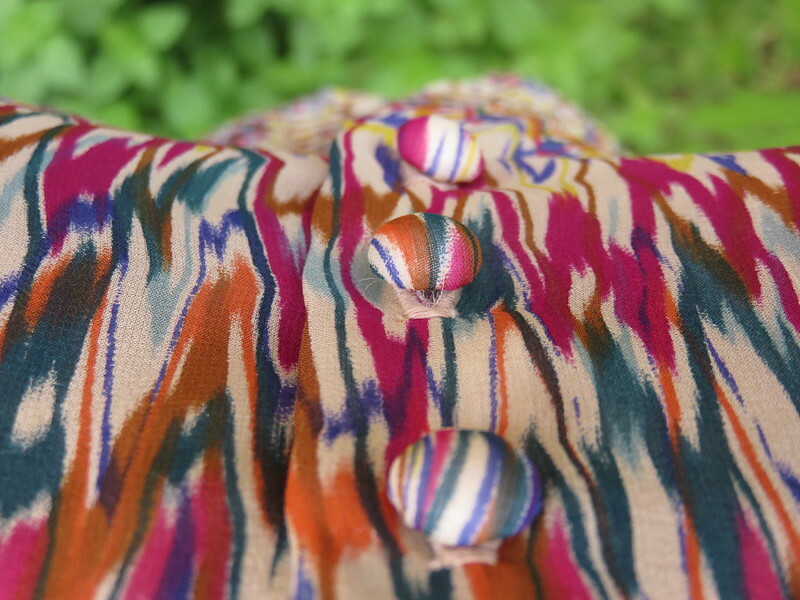 It started at Easter back in the spring, and I’ve been sewing up a storm, but never feeling like I wanted to photograph anything when I was wearing it. So I’m working backwards. In August I took DD2 and DD3 on a month-long road trip to Saskatchewan, Alberta and British Columbia. I grew up in western Canada, and had a deep need to drive for miles under the open sky, wind through the mountain passes, and dip my toes into the Pacific Ocean. 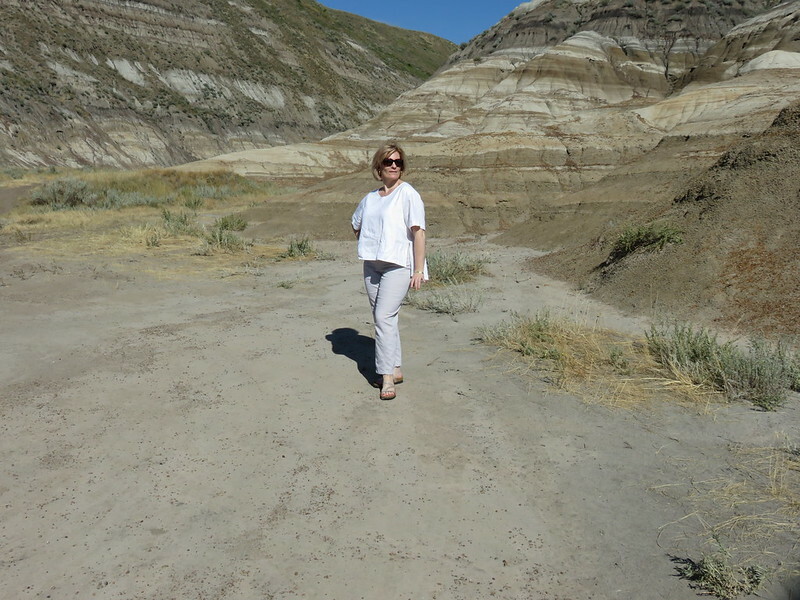 Along the way we visited Drumheller in the middle of the Alberta Badlands and home to the Tyrrell Museum. It’s ground zero for dinosaurs. Now, I’m not particularly interested in dinosaurs, but I do love the geography of the Badlands. It’s dry, windy, dusty, incredibly surreal and other-worldly. See? 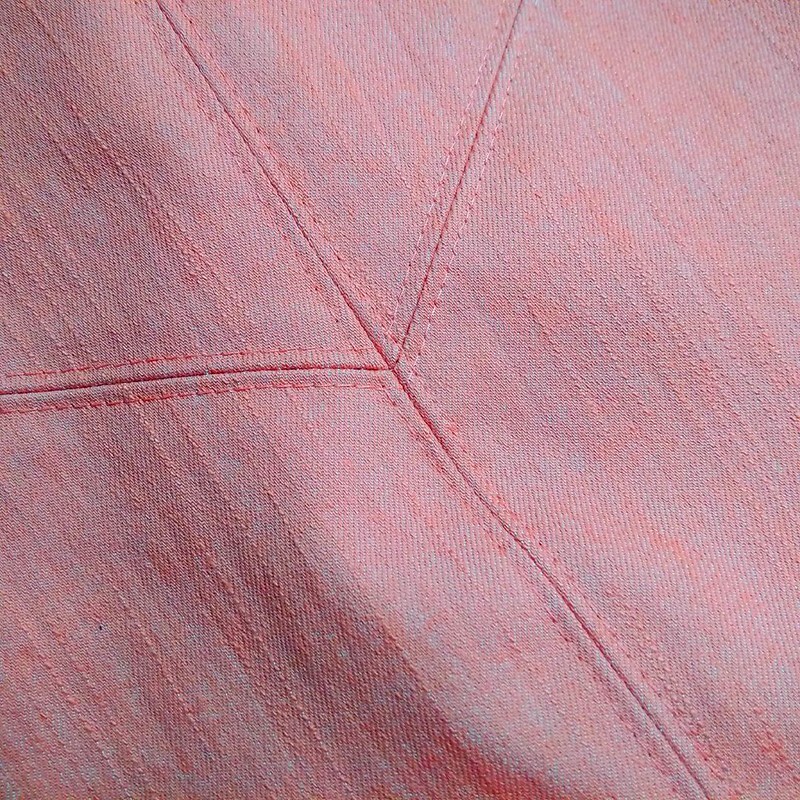 This is a softer, stretchier denim than the peach denim in the last post. This was actually the first iteration of this pattern. 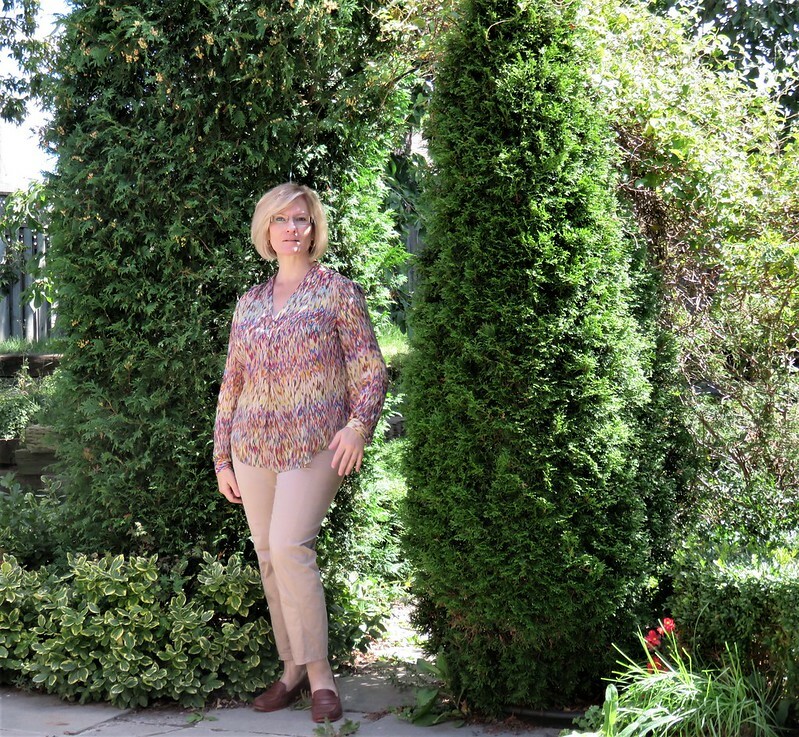 The top is from the last set of Donna Karan patterns that Vogue put out. I purchased it just because it was a Donna Karan pattern, and I’m glad I did. I love this top. 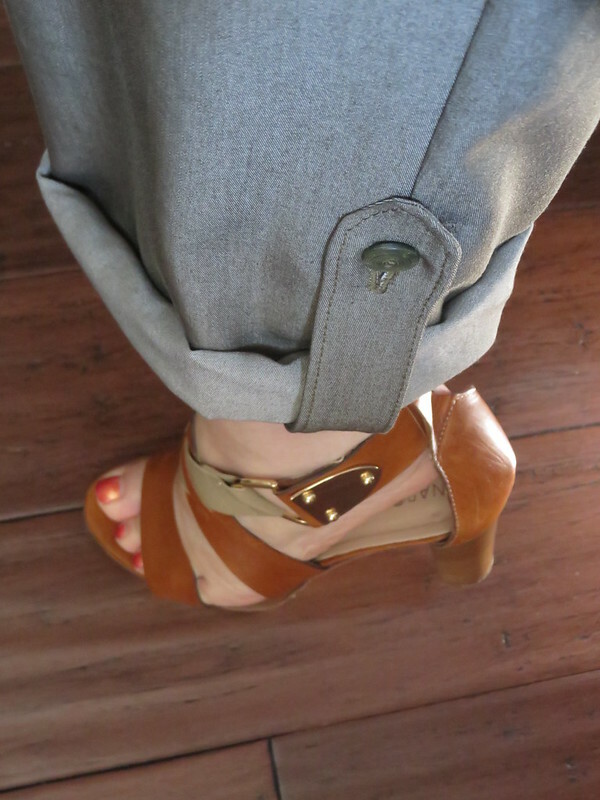 It’s boxy, but it’s so comfortable and so fun to wear. I made it up from a linen blend from very deeeeeeeep stash. I honestly cannot remember where I purchase the fabric, and that’s saying something, because I always remember where fabric comes from. 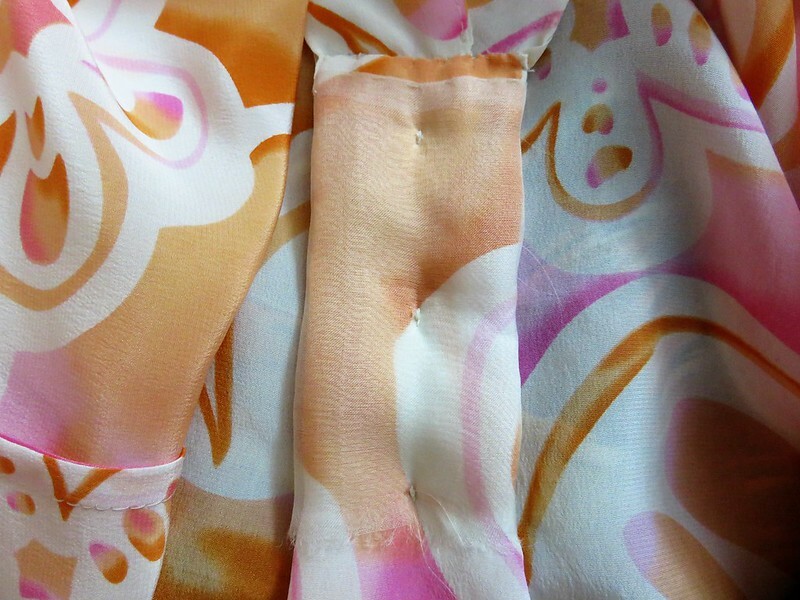 Now, I really dislike fabrics that show the outline of undergarments, and this wasn’t quite opaque enough for me. 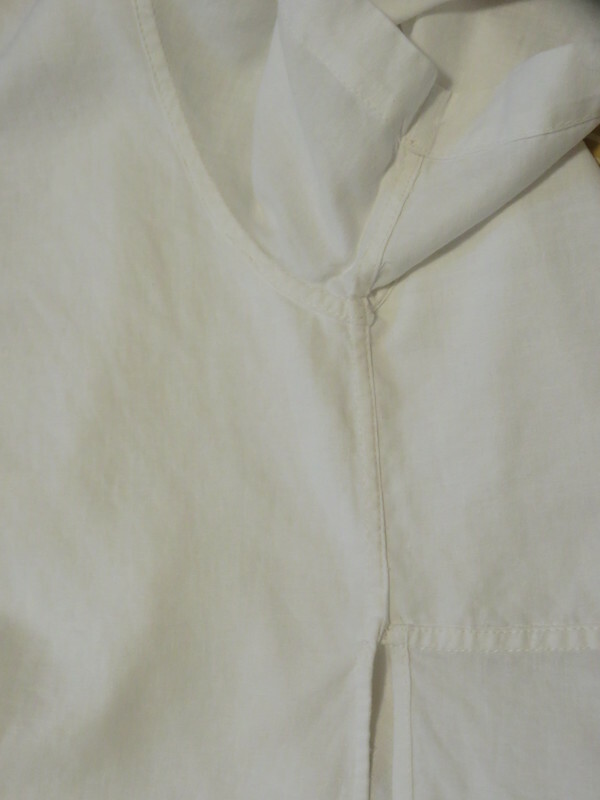 So I self-lined the bodice, and used flat-felled seams to ensure nothing will ever get shifty. 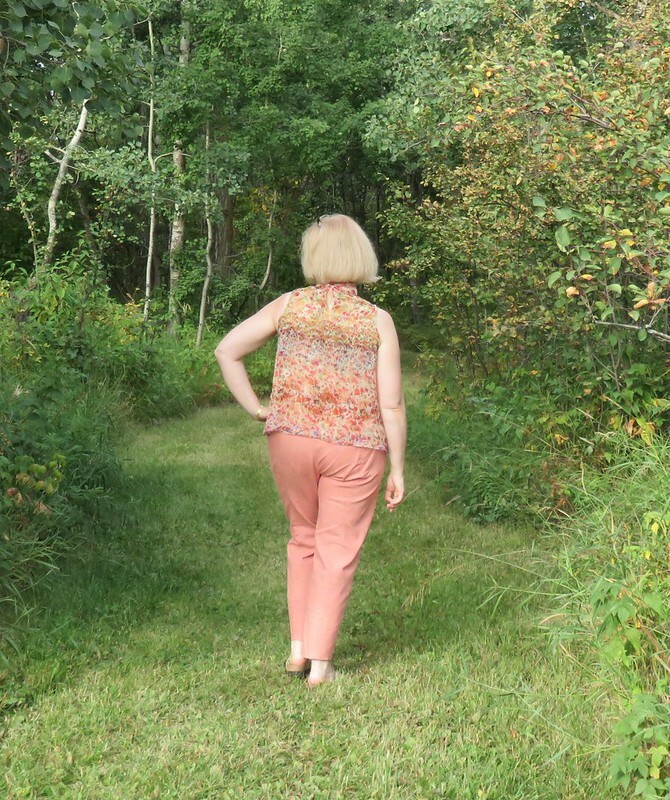 It was windy on the photoshoot, which worked in my favour, because it shows how the back flounce moves on this top. Here’s another photo to show how much ease is built into this design. 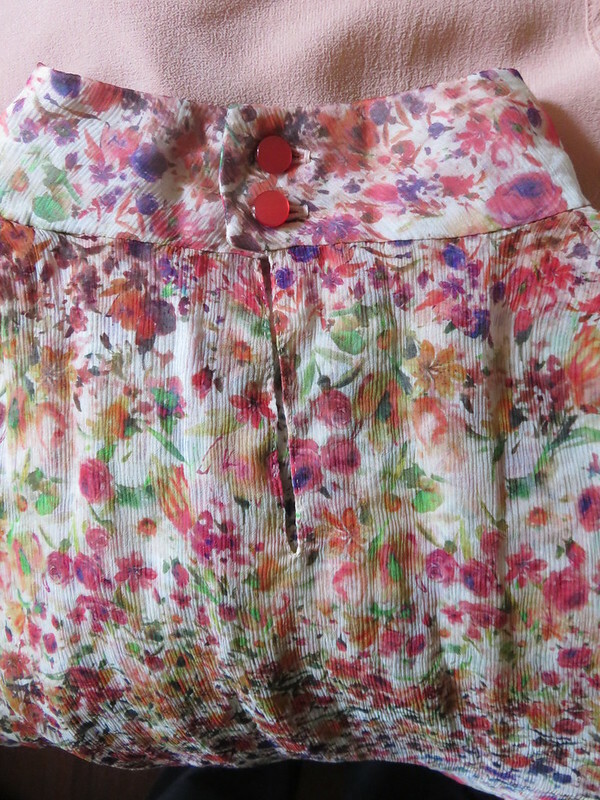 It made for a cool top in hot weather! And a last one from the front. Like I said, it’s boxy, but I’m somehow liking this at the moment. I’m finally taking pictures of my sewing projects since April. 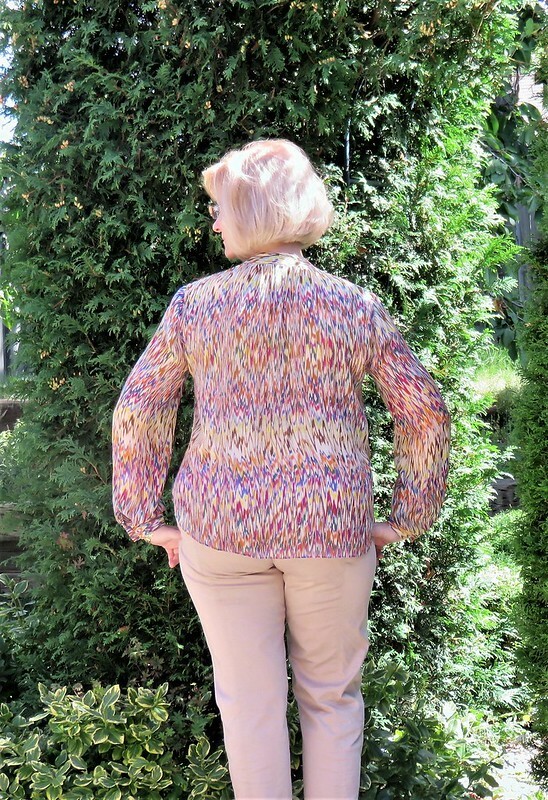 This is Marfy 1913, the blouse that everyone made a few years ago when Marfy released it as a free download. I’ve made several for other people, including modifying the pattern so it’s dress length, but this is the first one I’ve made for me. The fabric is from EOS. 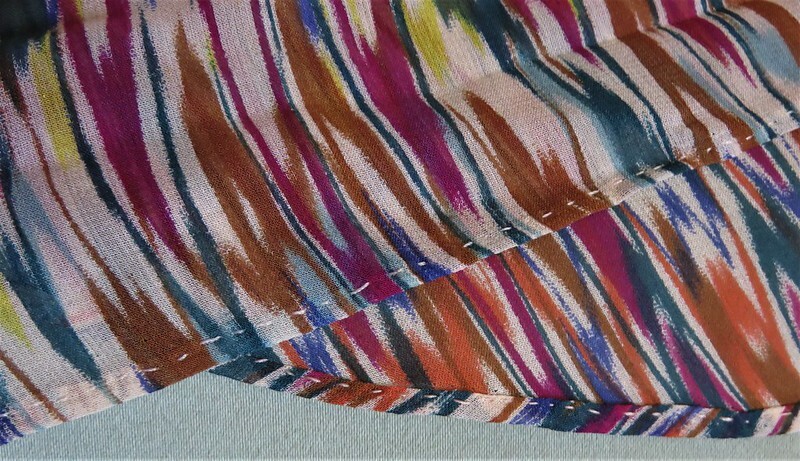 It’s a silk crinkle chiffon with the prettiest floral design. 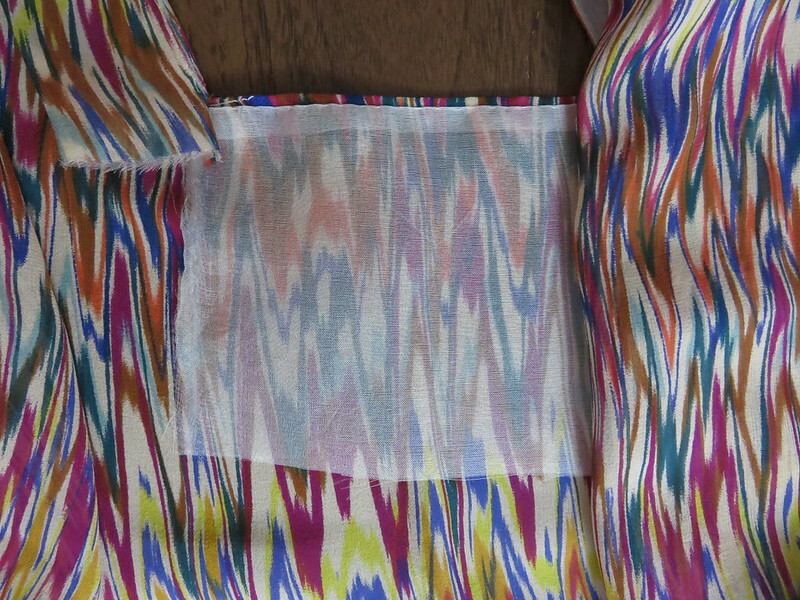 There was just enough fabric that I could make the blouse double-layered, and match the colour design of the fabric. Like everyone else who has made this pattern, I have plans for others. 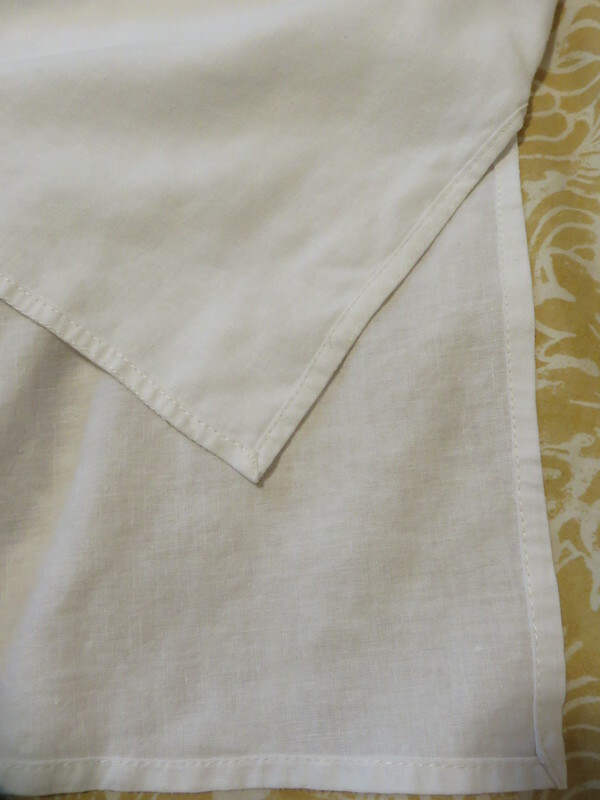 It’s not difficult to make, requires very little fabric, and is simple to alter. 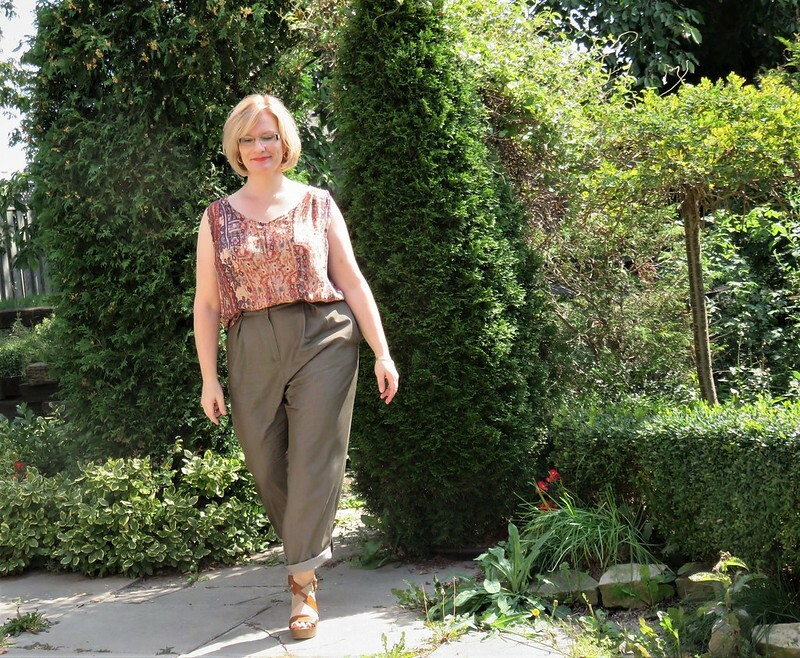 The trousers in this outfit are Burda 1/2016 #135. 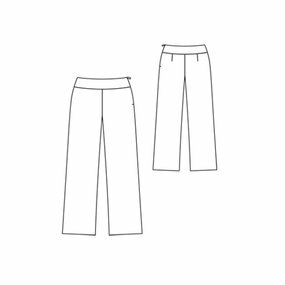 I’ve made three versions of them, which I’ll be sharing with you. I love the details, and I love how they fit. 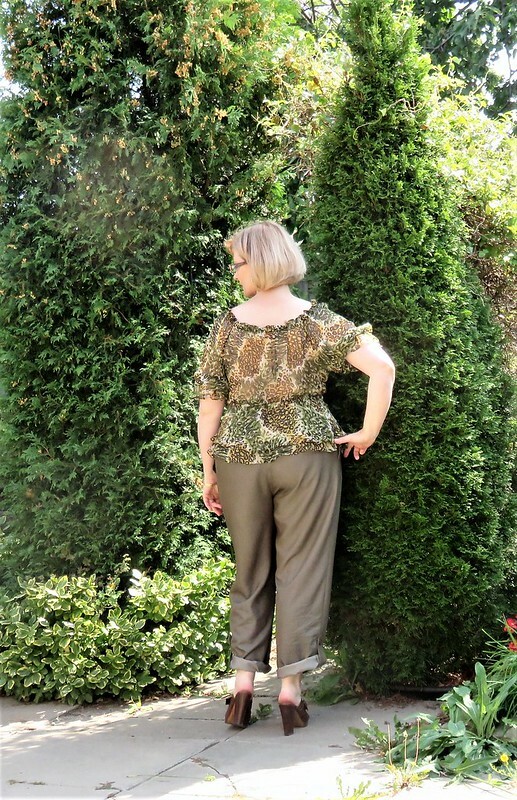 I’ve always shied away from slim fitting trousers, being a curvy shape. I dread looking like an inverted pyramid, but these seem to fit perfectly and they’re fun to make with all the seaming details. The denim is an Italian denim is from EOS. This also was a roll end. I was pretty pleased with the quality when I made these purple jeans, so I jumped when I saw this roll end available. 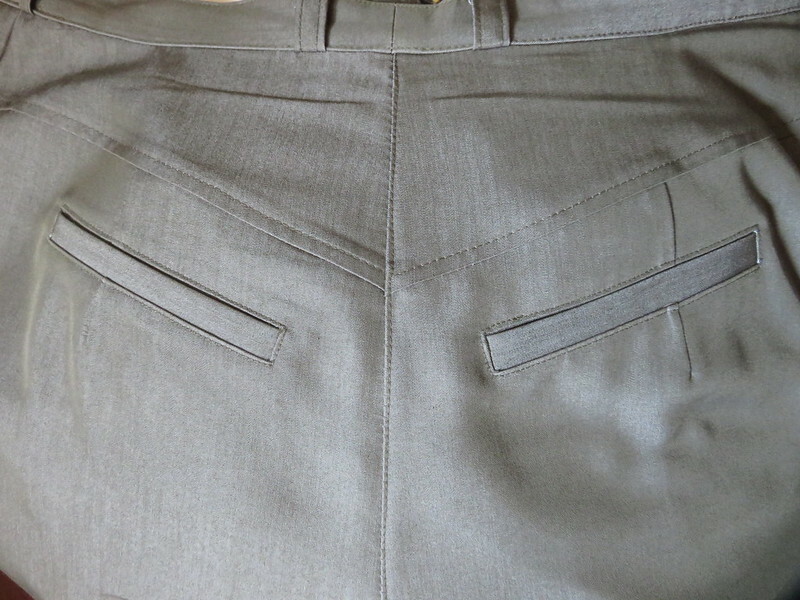 There was just enough to squeeze these trousers out of 1.3 yards. 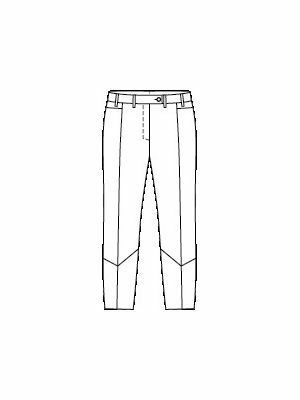 This denim has a lot of body to it, and feels quite different from the softer fabrics I made these trousers in, which changed how they fit. 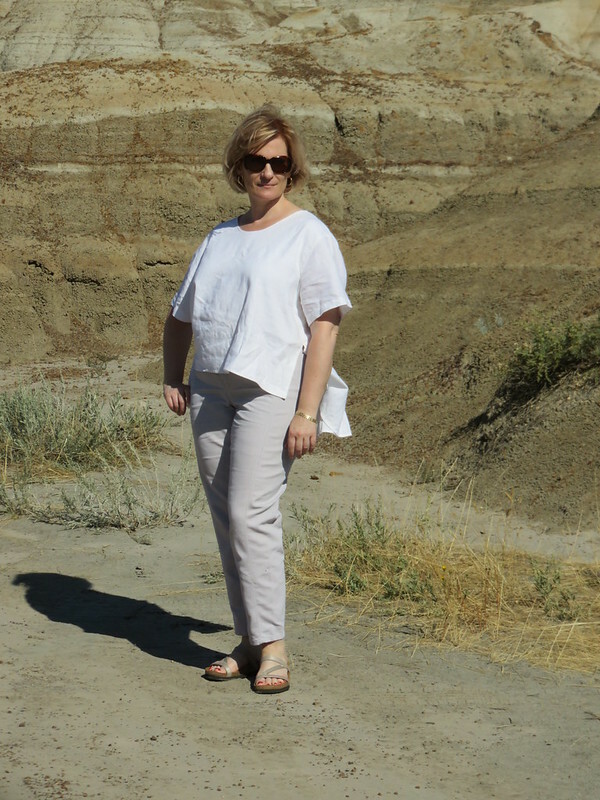 You’ll see this next time when I post pictures from Drumheller! I went on a road trip through my childhood haunts in Western Canada. 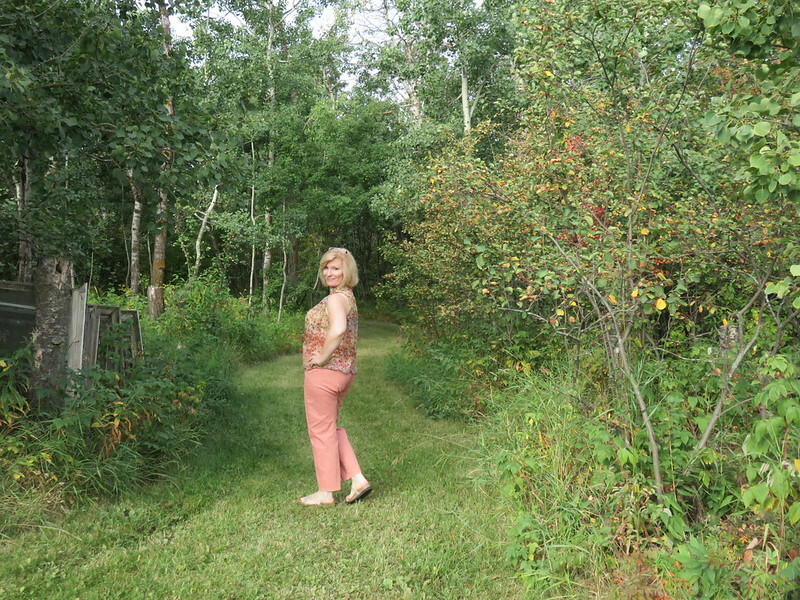 These pictures today are at my grandmother’s farm in Alberta. It was a great trip, although I didn’t purposely photograph what I packed and wore. Anyways, it’s great to be back!